Tweaking baby formula, whether to make it more like breastmilk or simply responding to perceived marketing demands, is certainly not a new idea. Some parents or grandparents will remember that they used to be able to buy low-iron infant formula until a 1989 American Academy of Pediatrics Committee on Nutrition statement recommended that there was “no role for the use of low-iron formulas in infant feeding and recommends that iron-fortified formula is used for all formula-fed infants.” Before that, low iron infant formulas were sold because many parents believed that the iron in formula could cause gas, colic, fussiness, and reflux, etc. Drinking low iron formula put those infants at risk for iron deficiency anemia, though. This is a good example that while some new infant formulas have "true clinical indications," others are used because of "parental preference," especially those formulas that are "marketed for infant fussiness, colic, and perceived gastrointestinal issues." That doesn't seem to keep parents from buying them. A recent study found that of infants who were not breastfeeding, only 69% were drinking a standard cow's milk-based formula. Others were drinking soy-based formula, specialty formulas, gentle or lactose-reduced formula, or even regular cow's milk. Infant formulas are regulated by FDA’s Center for Food Safety and Applied Nutrition under the Federal Food, Drug, and Cosmetic Act. Specialized Formulas: BCAD 1 (for children with maple syrup urine disease) to Phenyl-Free (PKU) and Enfaport (Chylothorax or LCHAD deficiency), there are highly specialized formulas for children with rare conditions. The latest additions to the old standards that many pediatricians recommended are baby formulas for spit-up and those for premature babies. Formulas for premature babies, including Enfamil Premature and EnfaCare and Similac NeoSure, make a lot of sense. They include more calories and calcium, which premature babies need. As you will see, many other types of baby formula are now actively promoted, but are most of these types of baby formulas actually necessary for kids? In other situations, when a baby has a true milk allergy, they should likely go straight to an elemental formula instead of a soy, comfort, or gentle formula, as any of those will likely trigger the same symptoms. Elemental formulas are more expensive than other formulas, though, which may be why parents opt to try other formulas first. But then, if your baby's symptoms got better on a comfort or gentle formula, he very likely didn't have a true milk allergy, since those also contain have milk proteins. Even with all of the new types of baby formula listed below, the United States is actually a little late to the party when it comes to trends in baby formula. For example, Nestle launched their BabyNes pod-based baby formula preparation system in other countries way back in 2011 and you still can’t buy it here. And, of course, most of these infant formulas have added DHA and ARA. Some also have prebiotics and nucleotides. A few even have probiotics. Again, some new types of infant formula make a lot of sense. For example, many babies spit up and parents were already adding rice cereal to formula as an acid reflux treatment, so added rice formula seemed like a no-brainer. But what about formulas for colic? Experts don't think that colic is caused by a feeding intolerance, so why do we need a special formula for colic. They also don't think that many babies are born with lactose intolerance, so why do we need lactose-free or reduced-lactose formula? We probably don't and keep in mind that those aren't true health claims on those cans of baby formula. Instead, "formula companies are placing claims on their products that use language to imply product-disease relationships without making direct health claims that would be subject to premarket approval by the FDA." So a marketing claim on the label says "for fussiness and gas due to lactose sensitivity," instead of a true health claim like "reduces fussiness and gas." But you probably don't need to change formula two or three times simply because your baby is getting older. You also don't need a special formula to supplement your breastfeeding baby. There is also concern that the way that these formulas are marketed, they might suggest to breastfeeding mothers that they should stop breastfeeding and switch to them when their baby reaches that age. The availability of store brand formulas isn’t new. It is a new trend that these store brand formulas are trying to keep up with all of the latest trends that we see in the big name formula brands. So now we are seeing Tender, Gentle, Sensitivity, and Organic store brand formula. That's a bit surprising from an industry that claims that a company's "marketing department's creativity" shouldn't be the most important thing about a formula. With so many different types of baby formula now available, it shouldn't be surprising that some parents are confused. In addition to confusion about which formula to choose for their baby if they aren't breastfeeding, there is now confusion about the ingredients in formula too. Should you worry about cane sugar in some organic formulas? What about the corn syrup in formulas? Isn't that bad for them? Like breast milk, every baby formula has to have a source of carbohydrate or sugar. While breast milk and cow's milk-based formulas use lactose (glucose plus galactose), other types of formula use sucrose (cane sugar) and corn syrup solids (glucose). And no, corn syrup solids have nothing to do with high fructose corn syrup, so you shouldn't worry about feeding these types of formula to your baby if you need to. Are New Baby Formulas Marketing Health or Hype? Dr. Steven A. Abrams, in his commentary "Is it time to put a moratorium on new infant formulas that are not adequately investigated?" suggests that there are problems with having all of these new formulas. He explains that "One problem with the use of these and similar variations in formulas is that often families will be switched repeatedly between formulas in the first weeks or months of life. These changes are often done without harmful consequences, but without identifying the most likely feeding problems or recognizing that normal infant behavior is occurring." Unfortunately, this can cause anxiety for parents, especially if they think something is wrong with their baby. They might compete with breastfeeding. Will a breastfeeding mom switch to a formula for reflux, gas, or colic if thinks her baby is having problems or use a supplementing formula unnecessarily? When thinking about switching to between these formulas, parents should understand that while infant formulas must meet specific nutrient specifications, they don’t need to be approved by the FDA before they can be marketed. We should all keep in mind that an Institute of Medicine report, "Infant Formula: Evaluating the Safety of New Ingredients," found that "although existing federal guidelines and regulations for evaluating the safety of food ingredients have worked well for conventional substances (e.g., vitamins, minerals), they are not sufficient to address the diversity of potential new ingredients proposed by manufacturers to develop formulas that mimic human milk." In addition to following the guidelines issued by that 2004 IOM report, we can help parents make evidenced-based choices for feeding their babies by adopting the 1981 World Health Organization International Code of Marketing of Breast-Milk Substitutes. Not surprisingly, the United States is not one of the 69 countries that have banned advertising of infant formula directly to parents, which is covered by article 5 of the WHO Code. Dr. Abrams also suggests that it will be helpful to continue to implement the Baby Friendly Hospital Initiative in more hospitals and establish working groups to evaluate new formulas. Until then, talk to your pediatrician before you stop breastfeeding or you switch your baby's formula. Belamarich PF, A Critical Review of the Marketing Claims of Infant Formula Products in the United States. Clin Pediatr (Phila). 2015 Jun 7. IOM: Infant Formula: Evaluating the Safety of New Ingredients, Released March 1, 2004.
WHO. Country implementation of the International Code of Marketing of Breast-milk Substitutes Status Report 2011. Published 2013.
WHO. Information concerning the use and marketing of follow-up formula. July 2013. 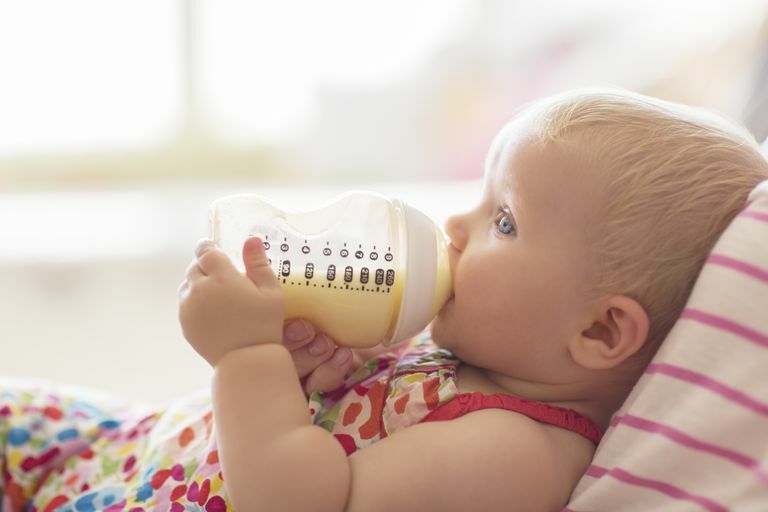 Does My Baby Really Need Lactose-Free Formula? Should You Feed Your Baby a Store-Brand Infant Formula? Should You Boil Water for Baby Formula? When Should You Give Your Baby Hypoallergenic Formula? Are You Having Trouble Finding the Right Baby Formula? When Is the Best Time for Switching From Baby Formula to Cow's Milk?